Now Accepting Applications for the John May Farm Safety Fund! Memorable Legacy or Major Obstacle In the Farmer’s Estate Plan? One mushroom growing operation proves farming in the city is possible and profitable. Most urban farmers have a tough time finding space to grow food. Location, high rent costs, and lack of infrastructure all make securing farmland in a city difficult. That’s why Tyler Case and Brian Versek of Philadelphia were thrilled when they found the perfect place for their urban farm: a cold, dark warehouse basement. Case and Versek, both in their early 30s, founded a Mycopolitan Mushroom Company in 2013, and moved into the basement soon afterward. The pair bonded when Case, a mushroom-foraging fanatic since his teens, invited Versek on a foraging trip. After a few years and a lot of experimentation, their urban (“-politan”) mushroom (“Myco-“) company is on solid financial footing and a go-to name for high quality, hard to find culinary mushrooms in the Philadelphia area. Case, Versek, and their sole employee, mushroom spawn-producing expert Dan Howling, shared their story, including their start-up, challenges, future prospects, and call for more mushrooms to be grown in cities around the country. 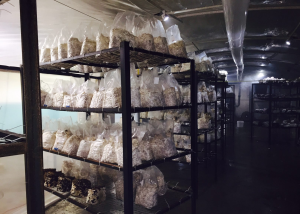 Bags of mycelia-filled substrate are close to fruiting in Mycopolitan Mushroom Company’s subterranean grow room: a high tunnel with humidity control. Case and Versek searched for land near Philadelphia nearly two years before posting a plea for leads on the Philadelphia Urban Farm Network, a local Google-group of urban farming enthusiasts. A user connected them with The Common Market, a nonprofit distributor of sustainable food from regional farms. The Common Market had just moved into a 70,000 square foot warehouse, with an unoccupied 10,000 square foot basement. It was a great fit. The Mycopolitan team erected two hoop houses in the basement—a heated incubation room, and a cooler humidity-controlled grow room. On the opposite side of the basement is an inoculation room where mushroom spawn is added to 6lb. plastic bags of sterilized substrate, starting the growing process. The Common Market partnership offers several benefits, including access to cold storage for harvested mushrooms, use of pallet jacks and a freight elevator, and even some backhauling of mushroom materials on the distributor’s returning trucks. Though its rent, electricity bill, and a Common Area Maintenance fee cost is $1,100 a month and rising, Case says the benefit of producing high-value mushrooms almost year-round make it a partnership worth keeping. The small, stepwise approach meant that even their substrate sterilizer—a hulking, steaming, burlap-wrapped sculpture on wheels that sterilizes hundreds of pounds of wood shavings and rye grain per week—was made by hand from found and borrowed materials. It may look funny, says Versek, but building a sterilizer saved the business thousands of dollars. There is, “a leap in infrastructure costs when getting above a certain size,” says Case. After three years, the company is growing bigger than its DIY-capacity can handle, but moving toward more professional equipment will still prove to be costly. 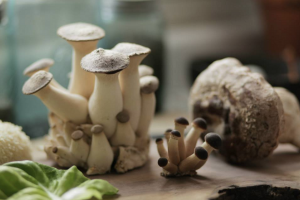 Trumpet and shiitake mushrooms are two of the more recognizable varieties grown by Mycopolitan Mushroom Company. It also grows fluffy white Pom Poms and glossy amber Namekos. One way Mycopolitan keeps costs down is sourcing its substrate—the medium and nutrition through which mycelia grow and eventually bear fruit (the mushrooms)—from other businesses’ waste products. Wheat bran and grain sweepings from the floor of a local flour mill, sawdust from a local lumberyard, and coffee chaff and grounds from a local roaster make up much of the substrate. Local is an ethos, but its also practical. Working with local businesses means not paying high shipping charges for heavy substrate. If Mycopolitan were to certify Organic, it would have to get substrate from further away. “It would be less sustainable and more expensive in the long-run to be Certified Organic”, says Versek. The business’s reliance on cleanliness is one reason why working toward Good Agricultural Practice (GAP) certification seemed like a no-brainer. “We assumed [a customer] would eventually ask us for [GAP certification], so it’s good to have around,” says Versek. The main difference, he says, is keeping detailed records of their cleanliness and food safety practices. Case, Versek, and Howling, are growing mushrooms just 30 miles from Kennett Square, PA, the self-proclaimed “Mushroom Capital of the World,” home to dozens of large-scale mushroom production facilities. But they are not worried about competition. “You have to build your niche: every environment is different, every locale is different, customers are different, things are always changing,” says Versek. Mycopolitan’s high-quality culinary mushrooms—including Trumpets, Pom Poms, Pioppini, Shiitakes, and Namekos—are unlike those of their larger predecessors. The company’s rare mushrooms and odd location set it apart, and helped Case and Versek educate Philadelphia chefs about incorporating mushrooms into their dishes when other seasonal produce is not available. Mycopolitan’s reputation for quality mushrooms seems to have surpassed its novelty as an urban mushroom farm. Philadelphia restaurants are responding enthusiastically, enough that Mycopolitan just increased its production space by 60% in late 2016. Unafraid of competition, Case says he would like to see more urban mushroom farms. “Considering what foods a lot of folks are eating, having even one meal a day be packed with things like phytochemicals, fiber, pro-biotics, pre-biotics, beta glucans, vitamins, and minerals would have a noticeable effect,” Case says. Mycopolitan believes more mushrooms should be on urban people’s plates, and more urban mushroom farms is a logical first step. Molly Riordan-Bucknum is the Cornell Small Farms Program associate for urban agriculture development. This article part of a case study on Mycopolitan Mushroom Company, part of a forthcoming report on commercial urban farming. The report, entitled “The Promise of Urban Agriculture,” is the result of a cooperative agreement between USDA AMS Division if Local Food Research and Development and Cornell Small Farms Program. To find out more, contact her at mer279@cornell.edu.